So, I'm making something for you! I don't exactly know what it is yet. It might be an e-book. It might be a private email series. It might be several ebooks or a small book in print! It might come in modules or units or themes. Or it might be an "information product" that is not any of those. It will help you tell stories. It will help kids tell stories with you. It will help you bond with others (because stories do that). It will help you become smarter, more empathetic, and more resilient (because stories do that). It will be worth your time and you'll totally love it. I don't know yet when it will be ready for you. But I do know that I am working on it every weekday until it is done. And I wanted to tell you about it so that a) it wouldn't come at you out of nowhere when it comes forth in all its shiny glory; b) so that your excitement for it could help me stay excited once that just-beginning thrill wears off. Thanks for being awesome, guys. I'm going to make you something wonderful. p.s. A story Benjamin (now in kindergarten) made up the other day! Allow me to transcribe the sticky notes for you. Rice Squares: Do you like me? Toasted Oats: Do you like me? Almond milk: Do you like me? Unsweetened almond milk: Do you like me? Cow's milk: Do you like me? Frosted mini spooners: I like you. Benjamin has brought smiles to Everead in the past. Click here for more Benjamin. More of a "dialogue with breakfast" than a story? I can't wait to join story club! I need resilience. Haha! Perhaps. Actually, he had written out the post-it notes the day before. All of the "do you like me?" ones were evidence to prove to Levi that sentences can, in fact, end with a question mark. 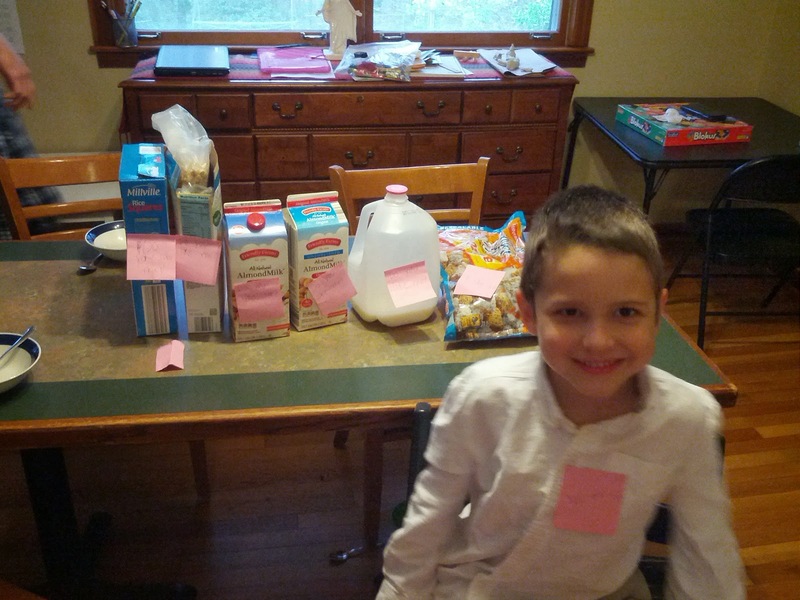 I thought the post-its were great (and perhaps evidence of a kindergarten love-letter having been sent to him?) and I saved them.